In recent articles about Hindi TV Serial Upanishad Ganga we have talked about the three important goals of human life Dharm (aka Dharma), Arth and Kam (aka Kama). The last an final goal of a human life according to Hindu mythology is Moksha (the ultimate freedom). Episode #12 discusses the same with the tale of KotiKarna. Hindu scholars have searched a lot about life and (possible) after life. And, all these knowledge is documented in Ved or Veda(s), Puran or Purana(s), Upanishad or Upanishada(s) and other books. If you search documents of any religion and almost all they say that at the end of the life, one wants the ultimate peace, the ultimate freedom; freedom from all the wishes. We found one of the teaches used say in his class of economy that “A man is a bundle of desires”! Very true. If there will be no desires, there will be no goals, there will be no fire ignited within to do something better and prosperous. The life could have been a burden if one doesn’t have any desire. Though, whatever starts, has to be stopped. If there is birth, sure there is death. If there is light, there is sure the darkness exist. There comes the time in a day when we want some rest. Over the weekend we want to take more rest. At the end of the year, we plan mini vacation. Why? Just to get rid of the routine and refresh ourselves, and get ready for the battle of life again. After many years of life, we feel that the body is now get older and gradually the desires should have to be less. It should then keep decreasing day by day so when there is the time of our last breather, we have no desire left, and we can sleep for the last time. But desires keeps one alive, it is the life, so how to get rid of them? Well, actually over the old age, when we talk that we need to decrease the bunch of desires, we mention the desires which are self centric. Hindu mythology also believes in four Ashram(a)s or segments of life, where the last Ashram is associated with the idea of living for the society, the humanity. Not acting for our personal gain but for the betterment of the society will ultimately takes you to the Moksha. 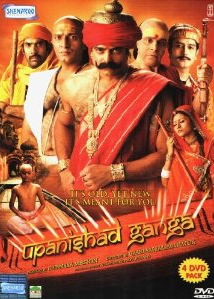 The makers of Upanishad Ganga wisely chose the story of KotiKarna to explore Moksha. KotiKarna was one of the wealthiest businessman of his time. It was said that there was almost nothing he could not purchase! He was thus arrogant too. There were the incidents shown to explore his characters properly. One day one sage met him at the bank of the river. KotiKarna offered him anything he wants, as he offer the others usually. The sage, first was not ready to demand anything, later asked KotiKarna to give his “arrogance”! There was one more interesting character, it was of a thief? What is interesting in a thief, right? Well, he was a truth-speaking thief! It is said that truth is like God. Two more important characters of the episode are the businessman who loan some wealth from KotiKarna and the widow lady. These characters are weaved nicely in the story and the writers needs to be applauded for the same. K. K. Raina is fantastic as KotiKarna. He had to play a multi-shaded character here, arrogant and wealthy in the first segment; and calm, composed and a sage with no desires in the second segment. He plays it very effectively. The scenes where we see the thief was hiding from the soldiers of the King, have nice usage of lighting. The part of the episode is shown filmed at outdoors, sets and rest on the theatre stage. You may find some discontinuity here due to changing canvas, but it is overall a smooth execution. The makers seems to take care when choosing the wardrobe and ornaments properly. The character of the narraters moves the tale ahead positively. At times you may find that some characters are loud and dubbing for some of them is done by voice artists. The background music is a positive aspect of the serial for sure. The director knows his job and executed it brilliantly. Chandraprakash Dwivedi have keep himself away from the screen so far in the TV series. He did the behind the camera work convincingly. The DVD quality is good. As the serial was aired in recent past, and filmed with latest technologies, you will find the video and audio quality on DVD good. The price could have been lower than what it is offered for. It could then be a feasible purchase by many viewers. Overall a philosophical episode which is a good watch.